What a cool style! 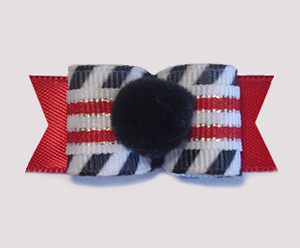 A white ribbon with diagonal black stripes is topped with an overlay of red & white stripes with a touch of gold shimmer. Flag back is red satin. A black pom-pom makes the finishing statement.